Neck pain is common among working adults in Singapore, but before we dismiss it as something trivial, do you know that neck pain happens when there is a problem with or injury to any of the parts (�structures�) in the neck? Bones � The neck has 7 bones that are stacked on top of each other. These bones make up the top part of the spine and are called the �cervical vertebrae.� Neck pain can happen when the bones get worn down or develop abnormal growths (called �bone spurs�). Ligaments � Ligaments are strong tissues that connect bones to other bones. Ligament damage can happen when the neck moves back and forth suddenly (called �whiplash�), such as in a car accident. Discs � Discs are cushions that sit between the bones. When the discs change shape or move out of position, people can have symptoms. 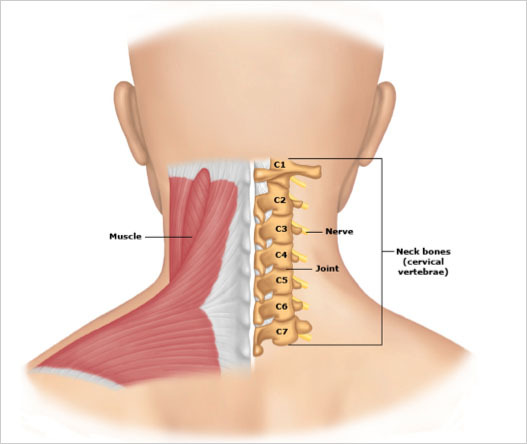 Muscles � Muscles hold the head up and make the neck move. Neck pain can be caused by muscle strain or tension, such as from poor posture or stress. Nerves � A bundle of nerves (called the spinal cord) travels down the middle of the spine. Nerves branch off from the spinal cord to all parts of the body. People can have symptoms due to neck nerve impingement, i.e. if their nerves are irritated or pushed on by nearby bones or discs. What symptoms can people with neck pain have? Most people do not need any tests. Your doctor will do an exam. He will feel your muscles and check how your head and neck move. X-ray, CT scan, MRI scan, or other imaging tests � Imaging tests create pictures of the inside of the body. Is there anything I can do on my own for neck pain relief? Put ice on the area to reduce pain � You can rub ice on the area for 5 to 7 minutes. Or you can put a frozen bag of peas or a cold gel pack on the area for 20 minutes at a time, a few times a day. Put heat on the area to reduce pain and stiffness � Take a hot shower or hot bath, or put a hot towel on the area. Don�t use heat for more than 20 minutes at a time. Don�t use anything too hot that could burn your skin. Do neck exercises � Different exercises can stretch the neck, shoulder, and back muscles and help make them stronger. Ask your doctor or nurse if you should do exercises, and which ones can help your symptoms. Reduce stress � Stress can make pain worse and prevent symptoms from getting better. Try to reduce your stress. You can ask your doctor or nurse about exercises that can help you relax. Watch your posture � Try to keep your neck straight in line with your body and avoid activities that involve a lot of neck movement. When you sleep, keep your head and neck in line with your body. Try to avoid sleeping on your stomach with your head turned to one side. Your doctor can use other treatments if your neck pain doesn�t improve after you treat it at home. For example, he might suggest that you see an exercise expert, called a physical therapist. Or your doctor can inject a numbing medicine into your neck. Use good posture � Hold your head up and keep your shoulders down. Whether you are seeking stiff neck treatment or neck pain relief in Singapore, our neck pain specialists are more than happy to assist you.